This toy is beyond awesome! Every child we know at Richards Variety Store has way too many crayons and most of them are usually broken and who wants to use the broken ones? Small crayon pieces get everywhere, making a mess when they get stepped on and are in general just annoying. Well this fabulous crayon maker takes those annoying little pieces and melts them slowly through the use of a light bulb to mold the pieces back into whole crayons. You can easily remake solid color crayons or you can go crazy and make swirly multi-colored crayons. 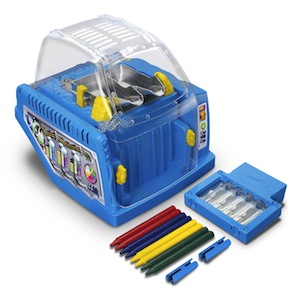 Crayon maker comes with 8 crayons and 2 molds but requires a bulb.